originally produced at Olney Theatre Center, Olney, MD. (Photo by Stan Barouh. Pictured: Paul Morella, Tonya Beckman, James Konicek, Susan Lynskey, Tracy Lynn Olivera.) A bitingly funny black comedy set in the land of desert golf courses, soccer moms, and play-dates, Rancho Mirage takes the audience into the psyche of post-Great-Recession-America – a place where affluence is perhaps our greatest mirage. 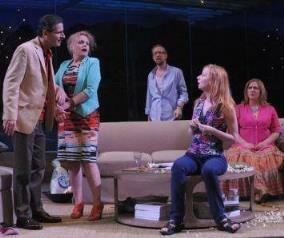 The play introduces the audience to three couples living in and around a development called Rancho Mirage. They are very, very long time friends, friends who have built up a nearly impermeable veneer of certainty and ease. That veneer is violently, hilariously stripped away when the only childless couple among them reveals they’re adopting a child from a nameless war-torn country… and to add insult to surprise, they’re moving there, rather than raise their child in a place like Rancho Mirage. The evening goes downhill (or uphill, depending on your point of view) from there, with all six of them revealing surprise upon surprise about just how imperfect their perfect lives have become. Whether your definition of success is about the zeros in your bank account or the number of kids in your mini-van, the play cheekily (but seriously) asks: what remains between us when our youth, our dreams, and our last bottle of wine is gone? I chose Rancho Mirage because the play confronts the illusions that led the country to the Great Recession; because it strikes a delicate and rewarding balance between emotional stakes and satirical sharpness; because it provides juicy roles for mid-career professional actors; and because it’s the newest play by Steven Dietz, one of the country’s most prolific and most-produced writers. Additionally, the press will be watching. As my first production at Olney Theatre Center ever, let alone as the organization’s newest Artistic Director, and as a World Premiere in a town hungry for them, Rancho Mirage is going to garner major press attention. There are a number of reasons we believe Rancho Mirage is going to have a long and successful life in the American theater. First, of course, is the play, and its current, funny and ultimately kind-hearted exploration of that deepest of American memes, the American Dream. Second is Dietz’s reputation and legacy of plays that have gone on to multiple productions – not least among them his last National New Play Network (NNPN) Rolling World Premiere, Yankee tavern, which had its first production in 2009, and has since completed more than fifteen additional professional productions, from small companies like PURE Theatre in Charleston, SC to large regionals like Milwaukee Rep and ACT. We’re hoping to follow the same path. With a Rolling World Premiere already in place, Rancho Mirage is already scheduled for three other productions in the fall following Olney’s production, and a fourth production has been licensed in California in the spring. The piece already has a continued life built in, and our job is to make sure the script is in the best shape possible so those other productions can be successful. Rancho Mirage requires actors completely at ease with and in control of their roles and the world the play inhabits. They must play confidently and get ahead of the audience, just barely, or the piece will fall into sloppy comedy. (As Dietz writes on the first page in his note to the production team, it’s not a farce, even if it reads as one.) That confidence only comes with sufficient time with the script, and sufficient time with each other to build great trust as an ensemble. Olney Theatre Center’s extra week of rehearsals for its production of Rancho Mirage, courtesy of the Edgerton Foundation, ensured that the piece received the first production it deserved. Unlike other applications to the Edgerton Foundation, we recognized this wasn’t a project that needed, say, an extra week for an ensemble to learn complicated choreography or music, or the manipulation of puppets or props. It’s that ineffable quality of a well-built and highly-functioning ensemble that we were after with the precious extra time awarded to us. You also know the realities of American theater production, which don’t pay proper attention to the specific needs of a work: three and a half weeks is presumed to be the amount of time needed to make any work ready for the stage. But as the Edgerton Foundation’s commitment demonstrates, that’s certainly not true for a new play. With help from the Foundation, we were able to use the precious rehearsal time at the table with the playwright to get absorbed in the kind of deep tablework and character-building that yielded spectacular benefits down the line. Without the pressure of getting up from the table to begin staging on day two, we were able to build real trust among the ensemble members. And of course, we could test and re-test the play for Steven to identify its hidden mechanisms and give him the time he needed to build on them. This production of Rancho Mirage was made possible in part by a grant from the Edgerton Foundation, National New Play Network, and Executive Producer Helen Marshall.